Marine debris is the name given to rubbish that finds its way into our seas and oceans. It’s hazardous to ships, swimmers, divers, beach users and marine life, and can stay in the marine environment for many years. In it’s original form, marine debris affects marine life but, when it diminishes in size as it breaks down, it impacts on marine food webs when it mixes with plankton. Marine debris can come from near and far, travelling on ocean currents. Predominantly it comes from land-based sources, such as beach users, stormwater drains, sewage outlets and blown from landfill sites. Marine debris can also be marine-based, such as recreational and commercial fishing vessels, tourist vessels and marine related industries, such as mining and shipping. Plastic resin pellets or ‘nurdles’ now make up a large proportion of marine debris and are almost invisible (generally less than 0.5 mm in size) until collected in larger quantities. These pellets are generally lost during manufacture and shipping, as they are transported to plastic processing factories around the world. They impact on the marine environment by adding chemical pollutants to the ocean and affecting a variety of marine life when ingested. 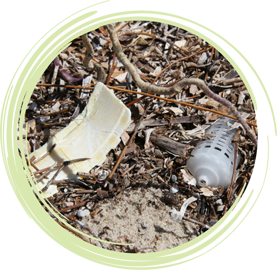 Visit the related links to discover more about marine debris, including the impact it has on the marine environment and what you can do about reducing marine debris.